Editor’s note: the following is our second article from Joshua Clark Davis, who previously wrote about connections between soul music in the Carolinas and Washington, DC. 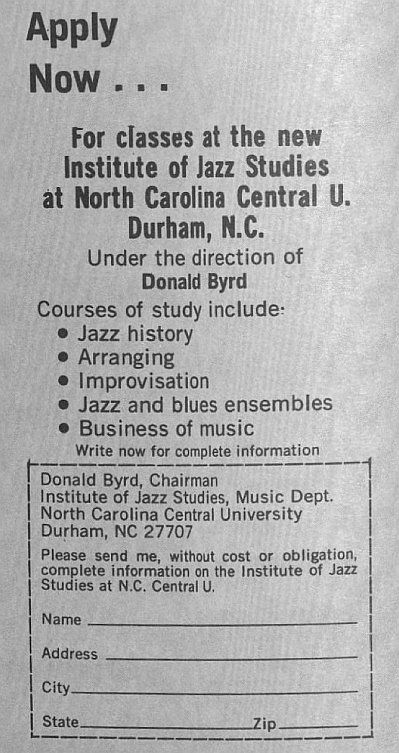 This story begins in 1967, when Gene Strassler, chairman of NCCU’s Music department, “telephoned Donald Byrd to inquire if he would bring some of his associates in jazz down to Durham to set up a series of lecture-demonstrations.” At the time, Byrd was best known as a veteran of New York’s hard-bop scene of the 1950s and early 1960s. 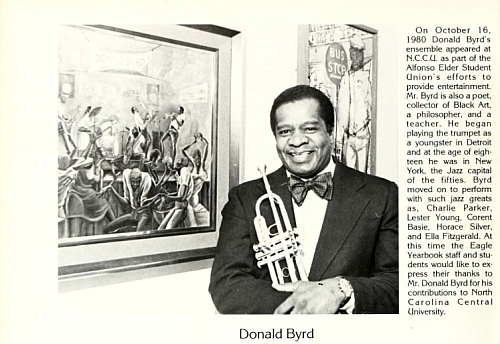 For the first half of the 1970s, Byrd worked as a professor at Howard University in Washington, DC, which at the start of the decade had become the first historically black college or university in the country to offer a bachelor’s degree in jazz studies. At the same time, Byrd was releasing the most commercially successful material of his career, much of it funky jazz and fusion for Blue Note Records. During this time, Byrd also served as a mentor, producer, co-founder, and writer for the Blackbyrds, jazz-funk crossover luminaries who were his students at Howard. Much more than a campus ensemble, the Blackbyrds achieved considerable chart success with hits like their homage to the DC outdoors, Rock Creek Park. By the 1975-76 academic year, however, Byrd had packed his bags for Durham, where he would become a professor at NCCU’s music department, and help to found the school’s Institute of Jazz Studies. Early in his tenure at NCCU, Byrd told Billboard magazine that he wanted the school’s music department to be the first “where the students make money for the school as opposed to most black schools where 90% of the students are on scholarship.” Just as he had done with the Blackbyrds, at NCCU Byrd offered classes on both jazz and the entertainment business in the hopes of teaching talented students how to make commercially viable music. At NCCU, Byrd recruited Stanley Baird, a recent graduate of the university, to work as an adjunct professor in the new jazz program. Baird also played in his own group, which was based on the other side of the state, in Asheville. One day Baird asked Byrd if he would produce his group like he had the Blackbyrds, and Byrd agreed, but only on one condition: all of the group’s members had to study or work in NCCU’s jazz program. Problematically, three of the group’s key members—Thomas “Bonnie” Clyde, Norris Duckett, and Aaron Mills—didn’t even live in Durham. But Baird convinced the trio to move to the Bull City, and Byrd ensured that the school accepted them as students. 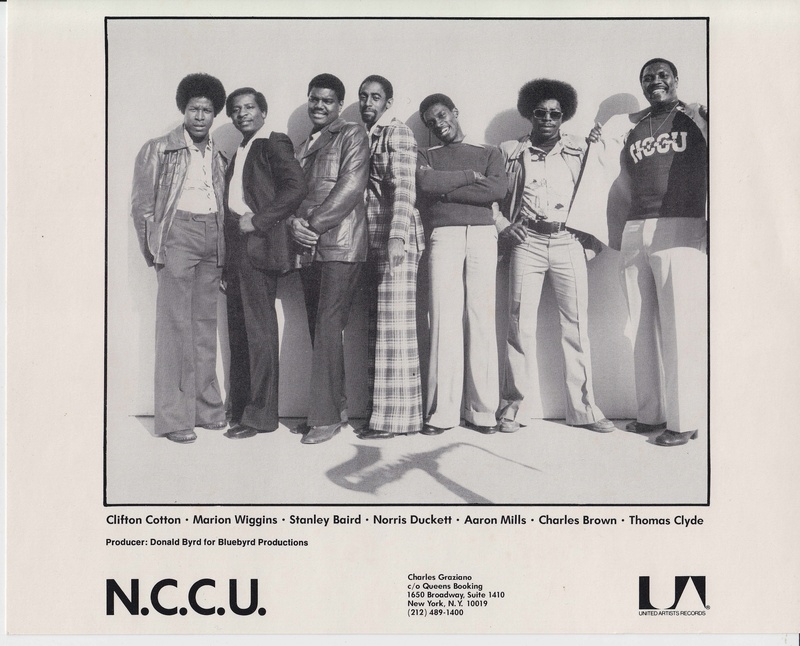 Together with three other students—Clifton Cotton, Marion “Mouse” Wiggins, and Charlie Brown—the musicians formed a funk-disco outfit that they dubbed the New Central Connection Unlimited, better known as N.C.C.U. In 1977, Byrd secured a major label deal with United Artists to release their debut album entitled Supertrick. The long-player’s standout track is “Bull City Party,” perhaps the all time greatest Durham anthem, which Byrd co-wrote. Byrd also produced the album, and department chair Strassler wrote the liner notes. Although N.C.C.U. never made another album and disbanded within several years, many alums of the group enjoyed professional music careers for years to come. Bassist Aaron Mills, for example, joined the famed 1980s R&B outfit Cameo and played on their monster hits “Candy” and “Word Up.” In the 2000s, Atlanta’s hip-hop duo Outkast sought him out to contribute bass lines to such hits as “Ms. Jackson” and “So Fresh, So Clean”. A recent viewing of NCCU yearbooks shows that Byrd was last pictured in the 1983 edition. By the late 1980s, he had moved on to work in jazz programs at North Texas University and Delaware State, while the 1990s saw a big revival in interest in his career with many hip hop producers mining his catalog for samples. Rest in peace, Mr. Byrd. The Bull City salutes you.